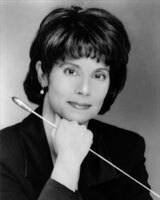 Acclaimed by The New York Times as “...one of the finest conductors of her generation,” JoAnn Falletta serves as the Music Director of the Buffalo Philharmonic and Virginia Symphony Orchestras, and Artistic Advisor to the Honolulu Symphony. An effervescent and exuberant figure on the podium, she has been praised by The Washington Post as having “Toscanini’s tight control over ensemble, Walter’s affectionate balancing of inner voices, Stokowski’s gutsy showmanship, and a controlled frenzy worthy of Bernstein.” Both on and off the podium, she is a vibrant ambassador for music and an inspiring artistic leader. Ms. Falletta has been invited to guest conduct many of the world’s finest symphony orchestras. Highlights of her guest conducting appearances in the 2006-2007 season included her debut with the Royal Liverpool Philharmonic, Lisbon Metropolitan Orchestra, Rotterdam Philharmonic, National Orchestra of Belgium and Shanghai Philharmonic. During the summer of 2006 she made acclaimed debuts with the Tokyo Metropolitan Symphony and the Jerusalem Symphony. Ms. Falletta is the recipient of some of the most prestigious conducting awards. She is an ardent champion of music of our time, introducing over 400 works by American composers with more than 80 world premieres. She is a prolific recording artist. Her growing discography will soon include over 40 titles. Together with English Horn soloist Thomas Stacy and the London Symphony Orchestra, Falletta received a 2006 Grammy nomination for “Eventide,” Concerto for English Horn, Harp, Percussion, and String Orchestra, by Kenneth Fuchs, from the CD An American Place, (Naxos American Classics). Ms. Falletta received her undergraduate degree from the Mannes School of Music in New York, and her master’s and doctorate degrees from The Juilliard School.